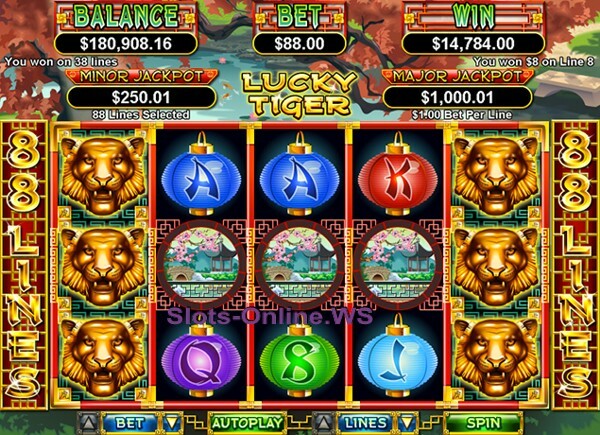 Lucky Tiger is a brand-new 5 reel, 88 payline slot machine game with Wild and Scatter animating symbols, 3 free spin style features with extra wilds and 2 random progressive jackpots. Released in November 2010 with Count Spectacular slot, this new Real Time Gaming game provides you with awesome winning opportunities, exciting bonus features and high-quality graphics. Let the Year of the Tiger be your luckiest yet, with this feature-packed new 88-line slot machine. Feng Shui coins will boost your progressive jackpot payouts. Wild: The Golden Tiger is a substitute symbol. Golden Tigers appear grouped on reels 1 and 5 and act as Wild symbols for every other symbols except scattered Gongs. Scatter: The Gong is a Scatter symbol. 3 or more scatter Gongs anywhere on the reels activate "Gong" bonus feature; 4 or 5 Gongs pay a prize of 18x or 188x total bet. Scatter wins are multiplied by total bet per spin. The other paying symbols on the reels carry the overal Chinese theme and include Plate, Chinese Symbol, Goldfish, Feng Shui Coins, Fan, Water Lily, Ship and 5 colored Chinese Lamps with A to 8 symbols. You can choose coin denominations from the range of $0.01 up to $1.00 per each line that results in up to $88.00 max bet per spin. The top non-progressive jackpot of 5,888 coins or up to €/$5,888 in currency can be won if you hit 5 Golden Togers in the Gong or Fortune bonus features only. Lucky Tiger's payout table contains a total of over 44 winning combinations because some symbols can be combined to create extra wins. A pick feature is triggered when 3 or more scattered Gongs appear anywhere on the reels in the base game. You must select a Gong to reveal 1 of 3 bonus features below. 8 Free Spins are awarded. 1, 2, 3, 4 or 5 scatters appearing in the bonus feature award 1, 2, 5, 8 or 25 additional free spins, respectively. All prizes are tripled (3x win multiplier) during these free spins. 8 or 18 free spins are awarded. During this bonus game all "Gong" symbols act as extra wilds. After scatter pays are awarded any "Gong" symbols appearing will morph into "Golden Tiger" substitutes, before line payouts are awarded. Any retrigger adds 5 additional free spins to the current feature. 8 free spins are awarded, during which the prize multiplier matches the free game number. Wins are x1 in the first game, x2 in the second game, x3 in the third and so on, to a maximum of x8. During this feature all "Gong" and "Garden" symbols act as extra wilds. After scatter payouts are awarded any "Gong" or "Garden" symbols appearing will morph into "Golden Tiger" wild symbols, before line payouts are awarded. Any retrigger adds 5 additional free spins to the current feature. Additional free spins are played at a prize multiplier of x8. The new attribute adds 2 progressive jackpots to the slot game. Major and minor jackpots increase in value with every player's bet, and neither have an upper limit. Once won, the major jackpot resets to $1,000.00 min; and the minor jackpot resets to $250.00 seed. Both jackpots are triggered at random, regardless of the coin denomination and lines selected, and independent from each other. Spin this unique online slot machine right now because this is a must-play game for all slots enthusiasts! Sun Palace casino - Get €/£/$500 free bonus to play new 20-line video slots. Vegas Casino Online - Scoop $500 bonus on sign-up, enjoy 90+ RTG games. Fair Go Casino - 300% match bonus up to $300 Free + 30 Free Spins. Dragon Lines - Free Spins 100 Line Slot from Ainsworth. Cash Cave - Free Spins 100 Line Slot from Ainsworth. Mustang Money - Classic 100 Line Slot from Ainsworth. Untamed Bengal Tiger - New Free Spins 30 Line Slot Machine. Monkey King - Bonus Feature 30 Line Slot Machine. Tiger's Eye - Free Spins 40 Line Slot Machine.